Tonight’s feature is THE KILLERS based on a story by Ernest Hemingway. Directed by Robert Siodmak and starring Burt Lancaster, Ava Gardner, Edmond O’Brien, Albert Dekker and Sam Levene, THE KILLERS is a terrific film. Enjoy the movie! 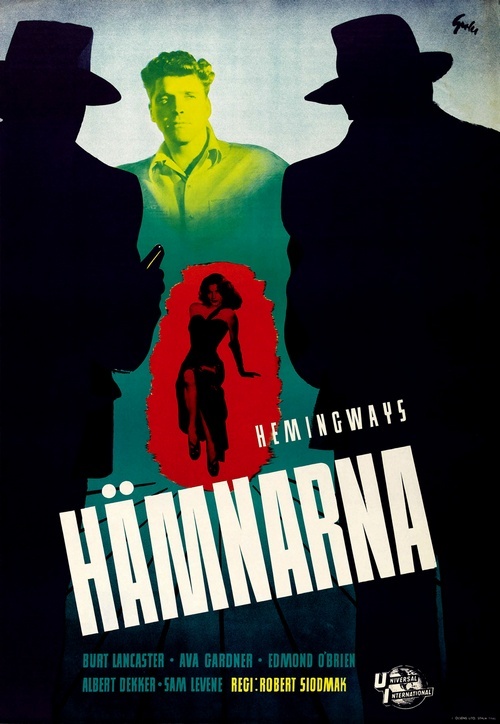 Two hitmen, Al and Max, drive into Brentwood, New Jersey, in search of Pete “Swede” Lund, and stake out a diner he frequents, questioning, among others, customer Nick Adams about Swede’s whereabouts. After the men leave, Nick races to Swede’s boardinghouse room to warn him and is stunned when Swede seems resigned to his fate. Shortly after Nick’s departure, Al and Max find Swede waiting in his room and shoot him to death. When it is discovered Swede had a small life insurance policy with Atlantic Casual, insurance investigator James Riordan begins investigating his murder.